If you have been following us for long, you know already that teaching science is hard for me. It is not that I do not like science, it is just that I struggle with teaching it. I am always on the lookout for anything out there that can help make science more fun for me. I mean, for my kids. That is why I was excited to be able to review Science4Us.com, an online science program for kids grades K-2nd. I have a boy that likes science. I have a boy who likes the computer. Perfect fit I hoped! Guess what? I was right! Yay me! Yay Science4Us! Let me tell you about it. Science4Us Online subscription is an interactive online science program for kids Kindergarten through 2nd grade that costs $7.95 per child per month. When you log in you have a choice of four Books of Science to study- Physical Science, Inquiry, Life Science and Earth and Space. Within each of those books are numerous modules (28 total) and then within each module are lessons. Yes, it is enough to keep you busy for quite a while. Once you choose where you would like to start, there are about 11-12 activities for each module. Five areas covered in every lesson are engage, explore, explain, elaborate and evaluate. Additional lessons cover multiple skills with activities like note booking, alphabetizing and playing games, but are slightly different in each module so that your child will not get bored. The lessons last from just a few minutes to about 20, with the explaining lesson usually being the longest. Within that lesson is a part called Show What You Know that asks questions to the child about what is being learned. Some of those questions are open ended discussion questions for you to have with your child to see what they are retaining while others include choosing the correct answer. If your child chooses incorrectly, that lesson will be replayed for them and they will have the chance to choose the right answer again. Another example of an activity is one called Silly Bulls. In it you put the vocabulary being learned into the right spelling order- broken down into syllables. Get it? Silly Bulls- Syllables?! My son thought it was hysterical and often did this activity multiple times so he could see the bulls dance. Each time the child comes back to their page their recent activity is checked off so they know where to start next. Under the area labeled My Tools, your child can access a glossary of words used for review or if they need a refresher on a word meaning. There is also a button called mini explain that has 1-2 minute videos that will further explain a term or phrase they might run into and are unfamiliar with. And then there is the Teacher's account. Once you log into this area you will find even more. Lesson plans are available for each module along with corresponding worksheets that you can print out for your child. There are different lesson pages available to print for Kindergarten, 1st graders and 2nd graders. Objectives are shown as well as an estimated time for that particular lesson. Your child can take the evaluating tests on their screen, or you can print out a slightly different version from this area as well. You can also access your child's progress reports and actually assign specific activities for your child to see when they log into their page. Been a while since you did science? There are professional development videos for each module for a quick refresher. From this teacher's page, you can also access your child's notebook to check their activities and even make your own notes on those pages. Which brings me back to the notebook feature on your child's page. Each child has a notebook in which they can take notes, draw pictures or do assigned worksheets. This is by far our favorite part of the site. Just about anything your child could do on their own notebook paper, they can do here, including change colors, size of font, label, draw free hand or use shapes. You can even embed a Venn or bar graph! In addition to that, once they are done and have saved their work they can print it out, or as I mentioned you can see it from your teacher's screen page. So how did we use Science4Us? Well, originally I had planned to use this as a supplemental science program. That lasted about a week when we were accessing the student's page only and allowing my 6 year old to work at his own pace. Once I had time to explore the teacher's page and find the lesson plans and worksheets, we put aside our current science curriculum and used Science4Us exclusively. Which, by the way, is what we will continue to do through the end of this program. I did assign CJ portions for a while which I think is a really neat feature, but eventually I stopped doing so and allowed him to work at his own pace. Usually he wanted to do many more lessons than I had scheduled so I stared printing out the whole modules' worth of lessons and activity pages and then kept them by our computer ready for whatever lessons we covered. I think for someone teaching multiple children the scheduling function would be of great help, but since it is just the two of us, we were much more flexible to how long we could do science. Because we were studying animals when this review started, CJ chose to start with the Life book. The two units were Living Things, which covered Plants, Animals and Living and Nonliving things, and then Balance in Nature which covered Food Webs, Habitats and Eco Awareness. So far our favorite has been the section on habitats. He has sorted pictures into habitats, made pictures of his favorite habitats and matched habitats to their descriptions. So what did we think? For a family who tends to push science off, I can tell you that we used this program consistently at least four days a week. This has actually been one of the hardest reviews I have written because there is just so much to the program that I would like to tell you about. What I saw when we just signed in and let CJ do his own thing pleased me. What I discovered after exploring the teachers site and attending a webinar on the program thrilled me. (I highly recommend you spend the time to do both!) 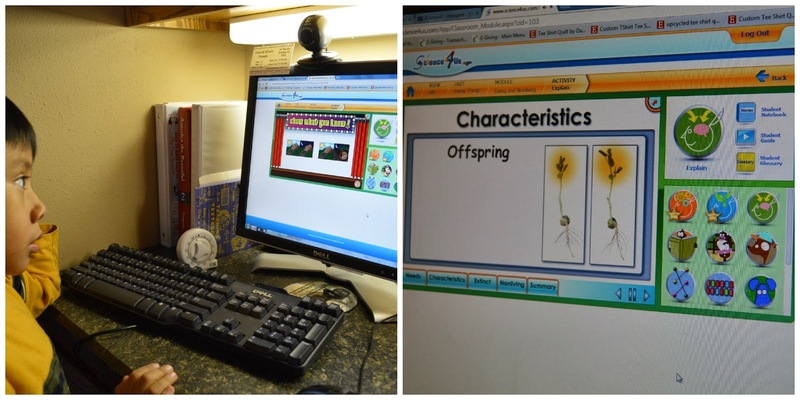 If you are looking for a web based science program for your younger elementary kids that they can do independently, you have found the right place. For those who are in need of a little more help, you can hover over areas and it will be read to you. If you are looking for a more detailed approach with lessons plans to guide you, you have found the right place as well. You can pick what you need! While I know this program is listed for kindergarten to 2nd grade, I am going to tell you that I think that most 3rd graders would benefit from it as well. This program is not dumbed down! Words like eco awareness are used, activities requiring alphabetizing are used and big concepts are taught. There is no doubt that after a year of Science4Us your child will have a strong science start. I am thrilled to have a program that takes the pain out of teaching science and puts the fun and learning back in. There are also some interactive demos online that you can try out to see what you think and an iPad app coming soon. Do your children argue? Come on, be honest! I will admit we have had many years of peace in our house. Not only did we just not tolerate arguing when the kids were younger, but quite frankly they just got along pretty well most of the time. But now it seems a certain 6 year old likes to torment a certain 12 year old. You would think that said 12 year old would just learn to walk away, but, ummmm, NO! So this week and probably for many others we will be working on this verse! We want our kids to enjoy unity with not only their siblings but also the people around them. I want them to know that getting along pleases the Lord. And mom! I have a bloggy friend who did a post on this verse and just this subject that I know would bless you to read. Gwen is the mom to 8 kids blogs at Tolivers to Texas. Pop on over and see how she is teaching her kids not to fight in her awesome post Siblings, Not Enemies. Next month, let's talk about JOY! Hope you will join us! If you are just starting you will want to read part 1, part 2 and part 3! Well we are not on the mission field yet. 3 weeks after the house sale was final my husband received orders with the military to move again!!!!! Not only move but to move in 60 days. What? Where did that come from? I know, it is from the Lord. Again we have seen the Lord work in ways we couldn’t imagine. This wasn’t our plan- it was the Lord’s. I thought we would have been in Canada somewhere seeking out how we were going to be serving him in coming years. Instead God moved us to Florida to finish out my husband’s career. I again may not understand or even like His plans but when I look back at those 3 years camping out, I see such good and glorious things God brought to us. 1. God has taught me that I don't need as much stuff as I thought I needed to be able to live. 2. I have to keep my eyes completely on him. 3. Let go and let God lead. 4. Trials can make us stronger. 5. My plans are not always God's plans and I may have to toss my plans in the trash. 6. It isn't always easy to follow God but the blessing that comes from it is well worth it. 7. Learn to be content with what God has given you. I thank God for that time in the camper and who knows, maybe we will have to do it again. If so, I will know God has a reason and I need to follow him. A BIG thank you to Tracey for taking the time to write down her story and for allowing me to share it with you.. It is our prayer that it will touch you and inspire you to trust God and allow Him to do big things through you. It is never easy, but it is ALWAYS worth it! We love the sound of music in our house. Do you? That's why we were so excited to be asked to review Kerri Gregors' KinderBach . We had the opportunity to review the iPad app of KinderBach last year and loved it, so I jumped at the chance to review the Online One year Membership with Teacher's Corner. Intended to teach piano to children ages 3-7, KinderBach has 6 levels of piano instruction, each containing 10 weeks of lessons. Each week contains four videos, lasting several minutes a piece. The site is so easy to navigate. Each weeks' screen has colorful buttons for the four videos to choose from. Once you choose which video to watch it will also show you the goal of that day's lesson so you will know what you are going to be working on. For example- "separating and numbering the finger digits." It also has a reminder button and link of the corresponding coloring or activity page you will need to print from the book if you have not already done so, as well as any additional supplies you may need like glue an scissors. A workbook file is included at each level for you to print. The Teacher's Corner is a special section for you the adult! It has digital downloads to help you teach your child or even a group of children. Lessons plans show each week broken into two days worth of activities. From playing games, to using rhythm instruments to actual piano work, Kerri tells you exactly what you need to teach your child. A teacher's aid book contains all of the games and activities you will need to print out and use. The teacher's guide is geared towards a teacher of a group, but talks about goals and theories used. There are also audio MP3 files, the student book and even certificates. How we used this program.? I have to admit that we did not use this program twice a week. Nope! We were on it much more often! CJ loves music and he loves Ms. Kerri, so it was an almost daily activity with us. To make sure we did not go through the level too fast we did repeat many of the videos. Since we had reviewed this program's iPad version last year, we started a few weeks in. I initially thought we would be able to begin with level two, but he had forgotten some things so we went back for a while and reviewed earlier lessons. That is one of the great things about this program, you can bounce back and forth between levels and weeks according to your needs. If your child needs additional practice on one lesson, you can re-watch that video as often as you need. While the lesson plans are broken down to 4 days a week, one of the glories of this program is that you can adjust it to your child's needs or desires. We would often watch all four videos for the week on a Monday and then repeat the ones he enjoyed most for the next few days or focus on the ones he needed more work on. I printed out the entire workbook for the level we were doing at the time, but loved the visual reminder on each day's lesson of what page would be used. What did we think? We love this program! It is easy to use and so kid friendly. Kerri has a great personality that I think just naturally draws kids to her. CJ thinks she is so much fun. She often asks the child a question and then waits to give them time to respond before moving on. She is also full of praise and encouragement. I also like that this program appeals to many learning styles. The videos are done well and have lots of color and animation to capture a child's attention and the catchy music and voices are great for those who have auditory learners. We did find the volume level tended to be more variable than we would have liked, but all in all it was not a huge problem. If you have a child who loves arts and crafts there are games to cut out and plenty of pictures to color and worksheets to do. One of the things that worked to our advantage was that we would pull up this program on the laptop and then take that laptop to the piano while we worked. Kerri often asks the child to play a song with her so if your computer is not near your piano or laptop, you will have problems with that part. If you are looking for a complicated way to teach, you will not find it here. Using cute characters like Dodi the donkey and his friend Frisco, Kerri helps kids associate certain parts of the keyboard or music scale with pictures, making them easier to remember. Dodi's "house" is represented by two black keys as seen below and a train station is a set of three back keys together. 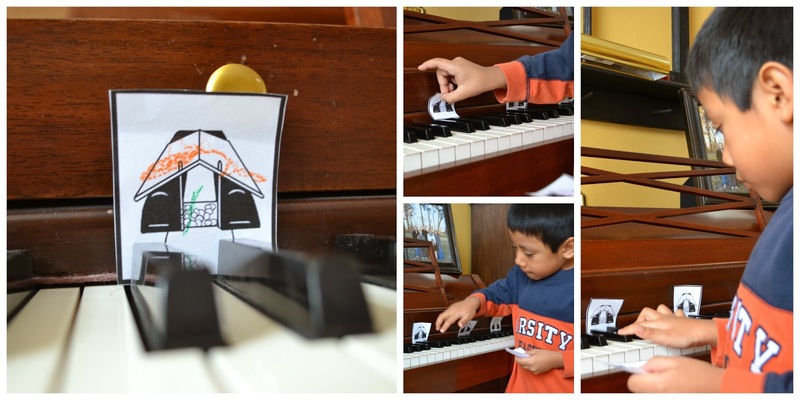 By combining these fun visual clues with her instruction, Kerri makes learning the piano fun. Because my older girls already play the piano well, this has been not only a fun program for my 6 year old, but also a huge confidence builder. As you can see from the pictures below, he was so excited to be able to "teach" his sister his new song. From my experience, the younger you can start a child on the piano and with music skills, the better. To be able to do so in a non threatening, fun format is the best. KinderBach is sure to deliver that and so much more. We highly recommend it for a beginning piano instruction program! KinderBach is currently running a special price of $95.88 for its one year online membership. That breaks down to about $7.99 per month. If you have priced piano lessons lately then you will know what a deal this is. A free online trial is available and will give you a good idea of what you can expect from this program. I encourage you to check out it with with your child and see what they think. OK, I know the month is not quite over, but I have a busy week of two great reviews for you coming up so I want to do our school month review today. Has February been hard for anyone else? Please tell me it isn't just me. I love the cold and snow, really I do, but it seems that February has been a rough month. Weather-wise and school-wise. I have been so antsy I started buying curriculum for next year -like we need new curriculum- and we seem to start school later and later each week. I assure you we are still getting it done, but well, let's just say some days we end pretty late. We are regrouping this week and taking a few steps to shake up our days a little. That is a post to come, promise! Until then, here are a few things we have managed to get accomplished. Learning to play the piano! This is with a review I will be posting on Wednesday. We have enjoyed Kinderbach immensely! Science in the kitchen! I cannot even remember where he found out about volcanoes, but he was determined to make one. Any homeschooling mommas out there recognize the Saxon fact cards? Ashton laminated them and made a tote bag out of them! Now it holds all of our playdough. Recycling at its best! I told you I would get her in this month's pictures! This is my piano queen! She is also taking voice lessons and so excited about participating in a drama camp this summer. Of course, while she is gone for a week, my blog may need some serious help. See? Snow! Plenty, thank you! And as if my house is not loud enough, my two girls have turned into a singing duo. To each other, to their brothers, to anyone that will listen. Even when we do not want to listen! Luckily they sound pretty good and are at the very least entertaining. They do crack me up! I am sure we have done more, and I know there are a few more pictures floating around that I cannot seem to locate at the moment. After being sick on the couch for over a week, you are lucky you did not get pictures of chicken noodle soup and blankets. It was that bad! Praying March is a brighter month for you and for us! Now that my daughter is living back at home, we have gotten back to sewing. Well, she has been sewing all along but when she is not around I am just not as motivated. I am not sure really what got her started with sewing. We were blessed to have two separate people in Wyoming that helped teach her a lot of the skills she has. 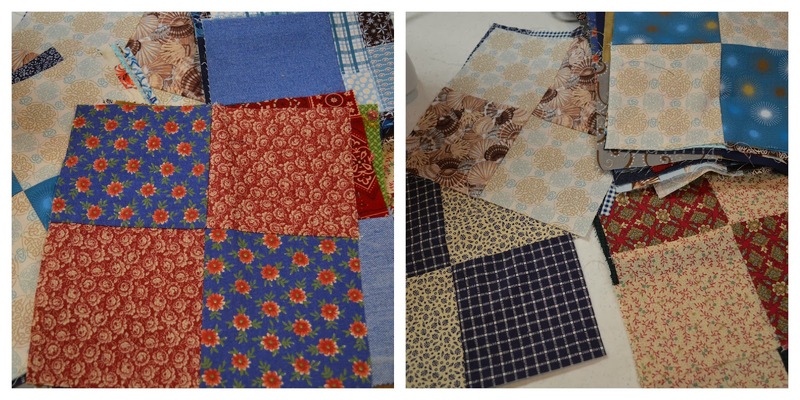 She also had a home economics class in which she made her first quilt. I taught her a few additional quilting skills, but most she picked up on her own. She was also blessed to be hired at a costuming shop on campus where she attended school for a year and a half and learned from a wonderful teacher and mentor there. Between all of that and running an online sewing business as well, you could just say this-girl-sews! I have fun sewing. It is her passion. Which explains why she is good at it and makes money and I do not. It also explains why she works on multiple projects at one time. 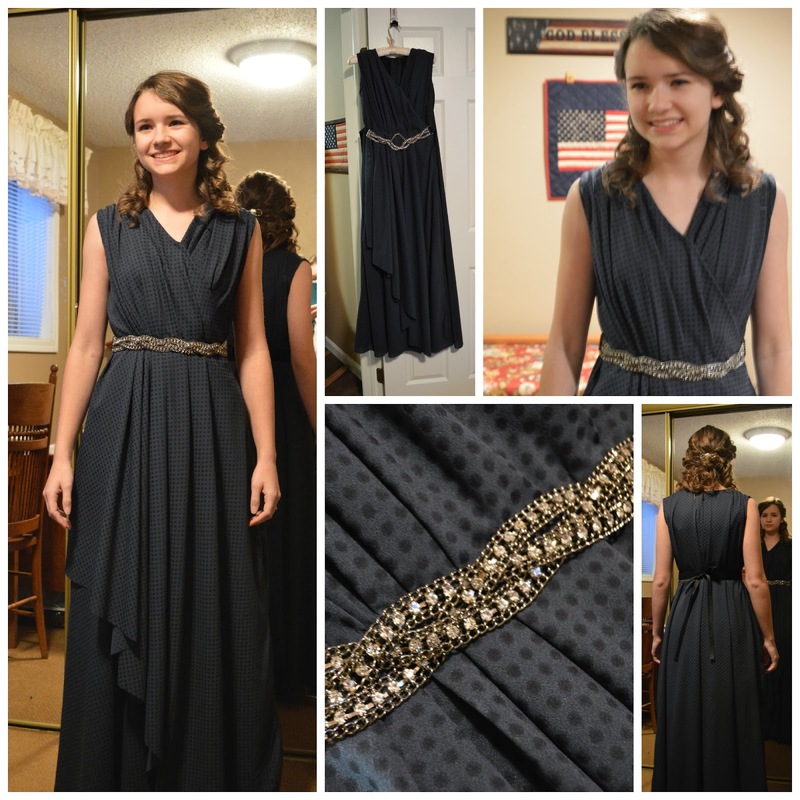 A formal dress that she designed. Yep, she designed it. Drives me crazy when she does that. I want to just find a nice pattern and be done. She wants to be original. Ugh! 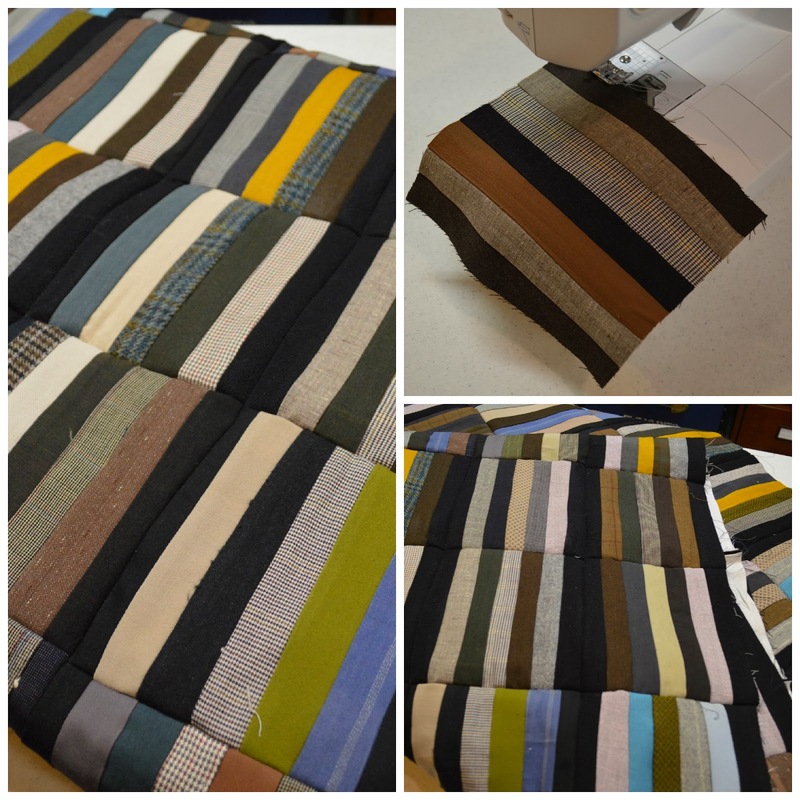 And this quilt she is working on. Actually she came upon the blocks at a local antique store and is now putting them together for a quilt for me. Ok, it is a quilt for her, but a momma can dream, right? And then there is this project for a friend who is working on a business endeavor. Can't give away his project yet, but when he gets famous, I will let Ashton share with you about her tiny role in it! Well, that is mostly my project, but it is a secret for now. See what I mean! Multiple projects! 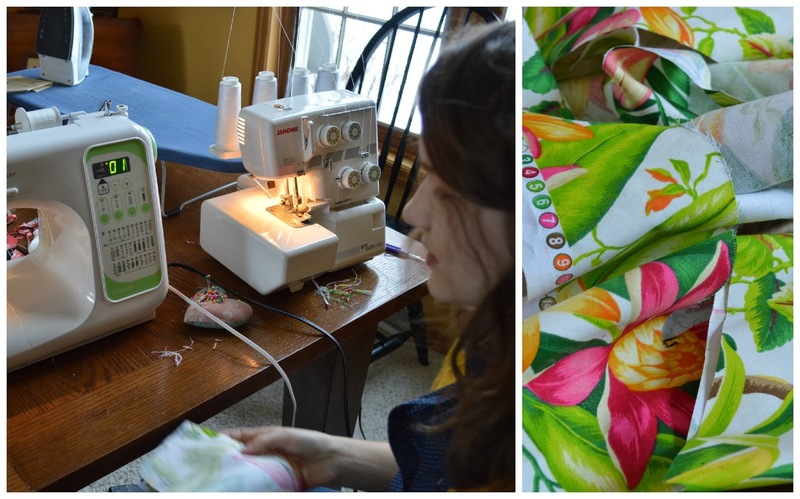 We are so excited to start linking up monthly with Jennifer at Milk and Honey Mommy for her Sewing to Summer Series. If you have a sewing project, or two, you would like to share, I know she would like to have you join us. Hey, maybe next month I will have a finished project to share as well. If Ashton will let me use her machine! Week 7? How did we get to week 7 already? If you have been with us from the beginning you and your family have learned 6 Bible versus already! That is fantastic. While we do not award our kids for learning versus in our home, it is always fun to surprise them with a celebration some times. So how about this week we go get a .99 vanilla cone to celebrate our diligence and hard work? How about you? 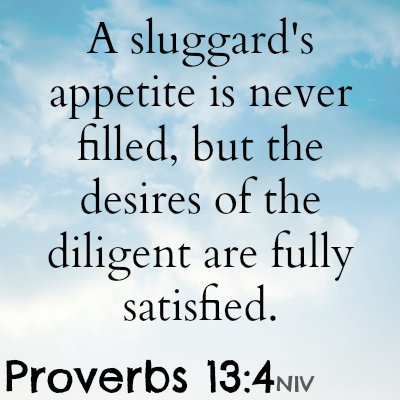 What are you working hard on in your house? See 'ya back next week for our last "child geared" verse before we head over to J-O-Y! Are you still sane? I know that if it were me, that would have been questionable. Let's just say, sometimes I am thankful God has called others to things that He has not called me to. If you are new to my friend Tracey's story, you might want to catch up here and here to get your bearings straight. For the rest of you...here we go...8 months into the adventure. As we are getting into fall and upcoming winter I remember asking my husband what we were going to do for warmer clothes. The military had all of our household goods and things in storage waiting to deliver to our new house! We just kept praying and trying to stay on the path God had put before us. We didn’t understand why this was going on but we knew we had to trust that God would get us through it. We started school in September and that was an event trying to school all four in a 32ft camper. There wasn’t a big table to have the kids use. It was a strategic plan on who was going to need the table and who could use the lap desks. I am sure I can now plan military plans after dealing with all that. We had many people at our church and family that sent us some warmer clothes as it got colder. As Christmas is approaching we continued to pray that God would sell that house SOON! We did go visit family for the holidays so that helped getting into a bigger space for a few weeks. Then we were back in our little home. Time went by and we were finally able to get our household goods sent to a storage building down the road from the house. It was kind of like Christmas again getting to see our old things. As the children started going through some of their clothes we realized that they had grown quite a bit since they had seen their stuff and didn’t fit into most of it. We donated a lot of the clothing and then trusted that the Lord would give us what we needed as we needed them. The Lord is always so good to us even when we don’t realize it. Time went by and we had our routine of how we were working things and just living day by day. We learned so many things as we went from day to day. 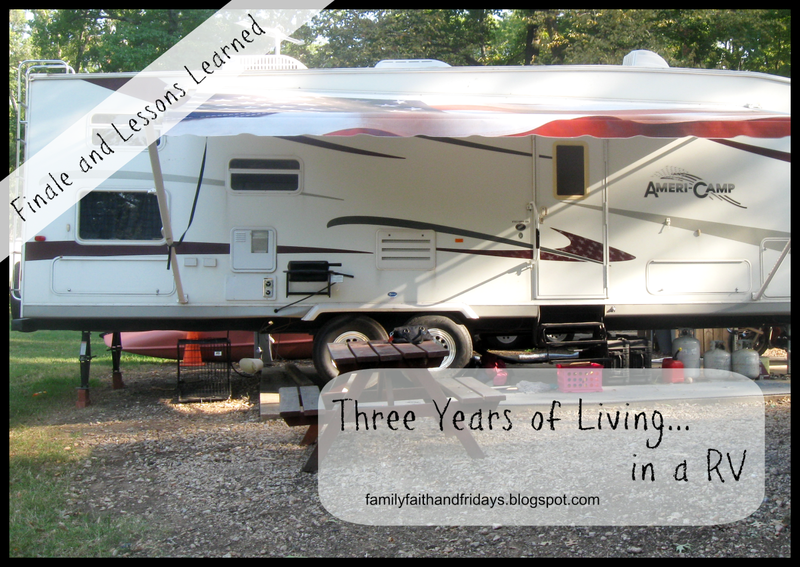 I learned how to do several things to the camper that had originally been my husband’s job. These were learned because of necessity when he would have to go out of town with the military. It was usually just 10 days or so at a time. I have decided that emptying the “black” water is NO FUN at all. Also the gas tanks usually run out around 2 or 3 in the morning when it is the coldest temperatures. But through all this we kept praying and asking God to sell the house and to give us what we needed to make living like that bearable. Before we realized we had come up to a one year mark. Wow that came fast. We looked back at the year and said it really didn’t seem like it had been that long and that we were amazed that we were able to survive living in that camper for that long. It was holding up pretty well. The kids had a good routine of walking the two dogs. We couldn’t just open the door and let them run around. They had to be on leashes and walked around the church property. They also learned to use the great invention of “poo” bags for dogs. We were on church property so we didn’t want our dogs causing messes everywhere. We continued to get involved at the church and the Pastor said that we could use the church kitchen to cook in and eat in. He also said that we could use the Sunday school rooms to do school in if the house hadn’t sold by the time we started back up. This was a HUGE blessing to us. The kitchen had 2 ovens, 2 refrigerators, a stand up freezer, and 3 sinks! Oh my, did I feel like I was in heaven. I love to cook and my 14 year old does too. This was great. We were singing praises to have this much room to do some cooking and baking. As you probably guessed it the house didn’t sell by the time we started school so off to the Sunday school rooms we went. This again was a HUGE blessing. The church also had some missionary houses that visiting guests/missionaries could use which came with a washer and dryer. We were once again blessed by being able to use these. It was getting expensive going to the laundry mat several times a month. We continued to pray for the house to sell and for God to help us as we were still living in that small little camper that was becoming more and more like a true home. It is amazing as I look back, that it wasn’t feeling that small anymore. Christmas came and went and still no sale. We were so happy with all the little and huge blessings God had given us that things didn’t seem so bad. We had the opportunity to meet some great people. Missionaries coming through were right at our fingertips and our family was able to have them over to the church kitchen and gym for supper. We were able to see all the people that worked behind the scenes of the church. Did you know that Church on Sunday morning doesn’t just happen? There are people that come and clean the pews and bathrooms. There are people that have to replace light bulbs and sweep and vacuum the floors. There is a lot that goes on and we were blessed to have seen and helped in all of that. My family no longer takes having a good roll of tissue in the stalls of the bathroom for granted. Praise God for all the things he let us be a part of. Before we knew it we had been in the camper behind the church for 2 years and it didn’t feel like a long time at all. We had settled in finally and were just moving about our lives there. Things were normal now to us and we were really content with our new type of living. The kids were enjoying being part of so many things at church. I no longer had to say we couldn’t make it to one thing or another. We still prayed that God would sell the house but we no longer had the urgency in our prayer. I was liking where we were! During this year we really started praying about what plan the Lord had for us after the military. My husband’s time left was getting shorter and shorter with each passing year. We thought by the 3rd Christmas that God was calling us to the mission field. In Jan. of 2013 (2 ½ years later) we start making plans toward going to the mission field. We had prayed and believed that Canada was where we were headed next. In March we got all the kids and our passports and were planning a trip sometime in the summer to go and visit and see where God would lead us. Now the kids are in ages from 11-16. They had adjusted so nicely to life in the camper. They had still had their problems but that would have happened if we were in a 3000sq ft. house. In April of 2013 a man called my husband about possibly buying the house. We had let the realtor go and were trying the For Sale by Owner thing. Of course the man’s offer wasn’t enough to cover what we owed on the mortgage. We just kept praying that God would work out details for us to be able to sell it. We kept trusting that the Lord knew what He was doing even if we didn’t know or understand. By May we were closing in on a deal with that man that would work for us and him. YES the house sold finally. It was 3 years and 3 months after we put it on the market. It was a long time and lots of things learned. See God does know what he is doing. We just have to trust in him and his plan and not let our plans we make get in the way. Do you ever wonder what God is going to call you to do? Do you ever wonder what your next adventure will be? I do think it is usually a blessing in disguise that we do not know in advance. I mean, really, how many times would we listen to the plan and then decide to tell God what we would like to do differently? Or not at all? I will be the first to raise my hand sheepishly! I KNOW that's what I would have done in Tracey's shoes. Live in a RV for years while our house sits empty a million miles away. No thank you God, how about this plan instead? Yep, that would have been me on a good day. Let's don't even go there with what a bad day would have looked like. Did Tracey have bad days? I am sure she did. But let me tell you- every single time I talked to her she did not share those bad days. Not that she was putting on her game face and not sharing honestly, mind you. But because, I am convinced, she was more concerned on being obedient to God and what He was calling her to do. By being quiet, she could better hear His voice. Not her own desires and expectations. But His. Am I being quiet enough to hear Him? I hope you will join us back next week for the last part of the story and the most important things Tracey learned from her RV life! Does your family have funny little sayings you use all of the time? You know, things that only your family probably gets but you can't imagine anyone else saying? After reading a book recently that shared a father's well known sayings with his family, I stopped to think about our family and the silly things we say. I knew we had a few. Then I mentioned it to the kids and they reminded me of many more. So just for some fun today - The Pleasants family sayings! See The Need! I think this started with an exasperated mom (me) who was tired of young kids stepping over something to get by rather than pick it up. Or children adding trash to an already overflowing trash can. It may or may not have been shouted in frustration. Situational awareness. This is said by dad - a lot! He originally used it to teach the kids about paying attention for unseen dangers. You know - keep your eyes open, watch out for the car, look around you, etc. Since it has been used for the boys especially to keep their eyes open to anything - someone in need of help, a car door that should be opened, etc. Trash in, trash out. Our parenting excuse for very little TV watching. Things may be cute and they may even make us laugh, but is it really gratifying, up-lifting or appropriate? Hands off, lips off. We got this from a friends' family, but we love it. Yes, we believe in courting and no, we do not allow dating in high school. I think we should get a sign and this on our front door now that the kids are older. Just kidding. Mostly. Less talk, more fork. This is a new one and repeated to a certain child at almost every meal. No other explanation needed, right?! Start rowing or get out of the boat. If you have been hanging out here for a while you may have read the post I wrote about this one. It was not my best parenting moment, but it does reiterate that we are a team and we need to act accordingly. I tell the kids that no one is going to love them like this family loves them so they better treat each other well. I promise I only say it in kindness now. I think! Oh no, Mr. Bob! This one my kids love. I can't even tell you where it came from but it is just for a whoops moment. Spilled drinks, trips and slips, minor mistakes. Hopefully it teaches us all to take minor annoyances and leave them minor! How much more joyful would life be if we could just laugh off the small stuff? That's beautiful, Katie. This is one the older kids say and it came from the movie Horton Hears a Who. They usually use it sarcastically when someone says "Look!" and it doesn't turn out so well. It makes the three of them laugh. Oh my, I could go on and on but I would be afraid to either bore you or creep you out. Do we even talk like normal people? I assure you we do, mostly! How about you? 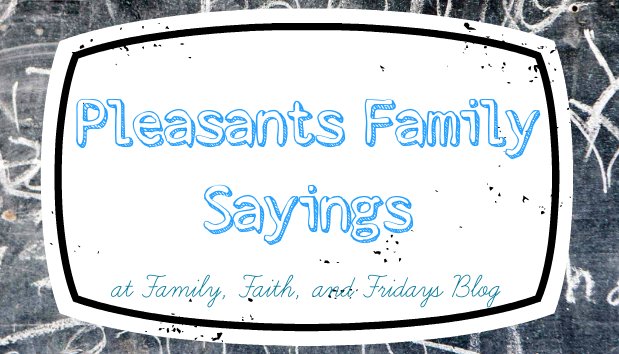 Do you have any Pleasants family sayings of your own? Yours - not ours, of course! Three Years of Living...in a RV, continued! What Can be Harder Than Science? Game Night - Let the Games Begin!